"My favourite food is Kebab. I think the word ""Kebab"" is of Arabic origin. It is one of the grilled dishes filled with nutritional and beneficial value to human body. 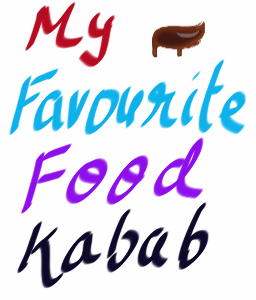 I like to eat Kebab because I have been having it since I was little and I am fond of eating grilled food. I have been to many neighbored countries and I have tried many dishes, but still I consider Kebab to be my great and favourite food. In fact,the famous kebab dishes in each country differs in its continent from one country to another, but there are the famous kebabs in Aleppo an Erbil. When I go on holiday to my favourite place like Hyderabad, I prefer to eat Kebab. I feel very good after eating this kind of food. It is very tasty and also healthy that sometimes I eat it in high quantity. Hyderabad is considered No.1 city in preparing this type of plates and most people in my friend circle love it so much. "